This was my most anticipated book of the year and it did not disappoint! Where the first book started a little slow and built up to that crazy cliffhanger, this sequel was packed with twists and turns throughout. In Three Dark Crowns, Katherine was my favorite and she still is. Without giving anything away, I'll just say that she survived the Breccia and came out of it a little....different. She is definitely more determined than ever to win that crown. She doesn't care who she has to take down to get it. Katherine is out for blood and I do not mean that figuratively. Arsinoe is dealing with the revelation that she is a poisoner. She knows she is the least likely to come out of this Ascension alive but that doesn't mean she'll go down without a fight. Her relationship with Jules is one of my favorite things in this book. They are so devoted to each other and Jules will protect Arsinoe at all costs. We also find out something about Jules and it is a real game changer. I wouldn't be surprised if she took the crown for herself. I don't think anyone can deny that Mirabella is the most powerful of the three sisters. Unfortunately, she is also the most sentimental and gentle. She does not want to kill her sisters and has to come to some distressing revelations. The character building was exceptional, especially for the secondary characters. - some of whom even had their own chapters. 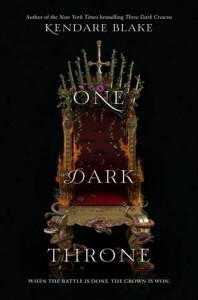 I have to say I enjoyed this book more than Three Dark Crowns. It is gritty, violent, and most of all, exciting. Of course it left us with another HUGE cliffhanger and I can't wait until the next one!